Hanoi (VNA) - Prime Minister Nguyen Xuan Phuc voiced his hope for stronger trade and investment ties between Vietnam and Tanzania while receiving two ministers from the African country in Hanoi on August 2. Talking to Minister for Industry, Trade and Investment Charles J. Mwijage and Minister for Agriculture, Livestock and Fisheries Charles J. Tizeba, he lauded Tanzania’s maintenance of an average economic growth rate of over 6 percent during the past decade and wished that the country will successfully realise the targets set in its Vision 2025. 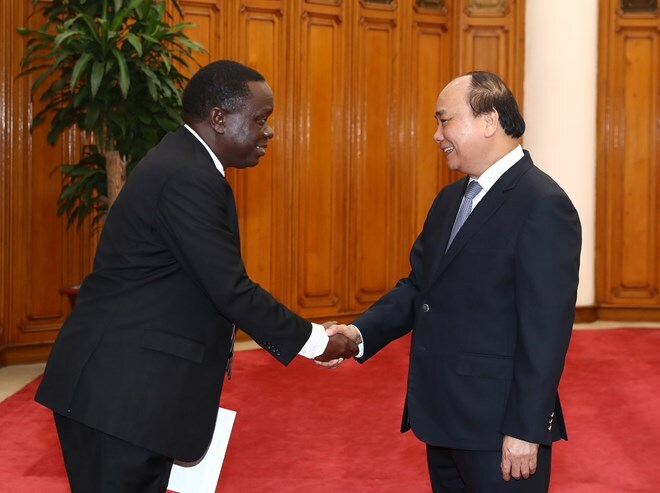 He thanked Tanzania for supporting Vietnam’s struggle for national liberation in the past and facilitating investment and business activities of Vietnamese firms, including Halotel – a joint venture of Vietnam’s military-run telecommunications group Viettel with Tanzania. Minister Mwijage said the two countries’ cooperation is developing strongly as seen in economic ties and business-to-business partnership. He highly valued Vietnam’s expansion of cooperation with African nations, including Tanzania – one of the fastest growing economies in Africa over the last decade thanks to strong economic reforms. He called on Vietnamese enterprises to invest in apparel, footwear, vegetable, plant oil and cement production in his country’s economic and industrial zones. Congratulating Tanzania on its economic achievements, PM Phuc promised the Vietnamese Government will step up providing businesses with information about export processing and special economic zones of Tanzania so that they can consider investment in agricultural and aquatic product processing, and electronic products, consumer goods, garment and footwear there. Vietnam is ready to supply goods with high quality and competitive prices for Tanzania to meet its demand, he noted. To fuel bilateral trade and investment relations, he asked both sides to soon conclude negotiations for the signing of a double-taxation avoidance agreement and another on investment encouragement and protection. The PM asked the African nation to facilitate the licensing of Vietnamese workers at Halotel while ensuring security and protecting assets of Vietnamese firms in the country.